I did not know there was a 2008 Spike TV movie called KUNG FU KILLER as sort of a David Carradine career-achievement tribute and unofficial KILL BILL spinoff. But I did believe that the title KUNG FU KILLER existed long before that, as some kind of 1970s drive-in/grindhouse-chopsocky deal, that directly inspired the KFK we discuss here, Teddy Chen's 2014 actioner. Like I say, I thought this title had been in circulation ever since the old 42nd Street fleapit days of the Nixon Administration, and Chen's big-budget martial-arts spectacular was either a remake or a reboot of one of those scratchy celluloid fightfests from the Bruce Lee era. But O my brothers, a search of the archives - even my cherished paperback compilation of the classic 'zine Asian Trash Cinema - does not disgorge a "Kung Fu Killer." And that book's even got South Korea's wonderfully titled GRUDGE OF THE MOON LADY. It's as though an archetype of every cheapjack Hong Kong action quickie had formed in all our minds. Though a "Kung Fu Killer" was never made, Teddy Chan comes along and does a handsomely mounted tribute. 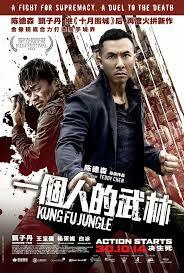 Which, in actual fact, was called KUNG FU JUNGLE, but somehow gained that fateful retitling. Now, when I say that it's the ultimate tribute to the critically reviled, badly redubbed, violent, martial-arts B-, C- and D-movies, you might get a picture in your heads of something post-modern ironic and silly, a la Stephen Chow's comedies or even Quentin Tarentino's output. But no. Teddy Chen approaches the material with quite a straightforward and earnest attitude, even while sprinkling the narrative with genre cameos of everyone in the HK action-film industry from legendary producer Raymond Chow and director Andy Lau to Jet Li and Jackie Chan (though, admittedly, these last two only show up in background movie posters or incidental film clips). The plot unfolds thusly. Jailed (at his own insistence) for unintentionally killing an opponent, kung-fu master Hahou Mo (Donnie Yen) is serving his time quietly when a mysterious, seemingly invincible serial killer on the outside starts methodically killing off former martial-arts contenders in Hong Kong, using the victims' own most celebrated techniques against them in the "finishing" moves. Hahou starts a prison riot just so he can inform authorities he has the inside knowledge of kung-fu culture and wushu fighting styles to be able to profile the nameless culprit. A lady police inspector takes Hahou up on his offer. But as the action progresses, it's clear Hahou Mo knows more than he's telling. Is he possibly in league with the limping maniac (Wang Baoqiang)? Despite lip service paid to the notion of kung fu as a disciplined philosophy and way of life, let's face it, folks, brutal and imaginatively staged fight scenes are the picture's raison d'etre. These do not disappoint. One is staged on a replica of a giant human skeleton. Another death match takes place on the movie set of a martial-arts period epic, full of handy swords and other archaic weaponry.